(MATT) Our plan had been to awaken early and to wait for the mail 'til about 10 a.m. (to see if Jon's letter supply multiplied again) but we awoke to really loud thunder around 8 a.m. and saw pouring rain outside so we rolled over and slept 'til 10 a.m. I cleaned up, went downstairs, and had a chance to talk to Mrs. Seiffert before the others arrived and she told me the short version of her story. I won't go into detail, but she and her brother knew Deitrich von Hildebrand and he encouraged them to go study in Salzburg where they did. 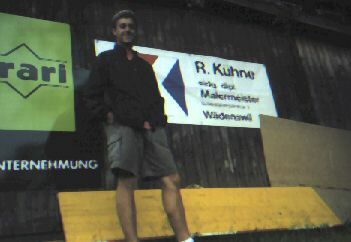 Guess who was also studying there--Mr. Seiffert,. And the rest you can figure out for yourselves. The boys came downstairs shortly and we had an almost American breakfast of cereal, coffee, and danishes! Quite a treat. We had said a St. Joseph prayer for another day of good weather and as soon as we got on the lift the rain stopped and the clouds broke. Thank you, St. Joseph. The hostel was $7 a piece and could care less if you had sheets or not. We took a walk up the hill toward Murren. We said the rosary overlooking a awesome valley and walked up to meet Jon. Then, after looking at a new improved awesome view, we walked back to the hostel. We sat on the porch and listened to a girl from Chris' hometown talk for a while, then talked to Gayle, a dental hygienist who promised that we would have a flossing party at 10 p.m. but was busy hitting on some guy when the magical moment arrived. We sat in the dining room regretting that Rick Steves didn't tell us that we could cook at this hostel and had a piece of beef jerky for dinner. Jon went upstairs while Sam and Chris played cards then checkers and I watched and wished I was old enough to play with them. (SAM) I showed Chris the fast and furious game of Speed and like a good sport, he played the game. After a time we changed the name to slaughter. Chris challenged me to a final game with high stakes, a triangle of Tobler Swiss chocolate. Jon smiled and we read each other's mind. You see, Jon and I, like sneaky (censored) had raided the Tobler without the knowledge of our comrades. Jon knew I had a slightly nibbled triangle of Tobler in my pocket. So we handicapped Chris and he squeeked out a victory. All the kids in the room cheered and I relinquished my crown to him and to Matt's surprise, gave him his promised triangle of Tobler. Jon and I thought it was very funny, but they were not so amused. But we are all good sports even though we always cheat. (MATT) Then Sam and I did the "read your mind," card trick for an American guy and a German fella. Then Chris and Sam also went to bed while I talked to the American about the NOLS, (National Outdoor Leadership School) and I learned alot. The other guys went to some instructions as well. The nature of their lesson I am not able to reveal not being myself well versed in the happenings of co-ed dorms. Anyway, I had a very nice evening as his very cute girlfriend joined us and we talked for quite some time. The other guys all hated the hostel for reasons I have previously hinted at but cannot actually reveal. If you want to know the source of their hatred--because I will not tell you now--you must ask them. I went to bed around midnight only to discover that Jon had taken my bunk. I fumbled around in the dark and eventually found my bed and went to sleep.